Severe aplastic anemia (SAA) is a serious bone marrow disease that needs a comprehensive and service-intense treatment with either bone marrow transplantation (BMT) or immunosuppressive therapy (IST); both are difficult to optimally offer in resources-limited countries. Here, we report the outcome of IST using horse Antithymocyte globulin (ATG) in 18 (7 children; 11 adults) patients with SAA referred to our center in west India. Only 18 patients out of 102 diagnosed as AA in 2 years could receive IST, largely due to costs restraints. Although CR was seen in 30% in adults and 33% in pediatric cases, but overall 50% cases were able to enjoy transfusion-independence, requiring no further treatment. Treatment related mortality occurred in 6.2%, relapse in 6.2% and 6.2% had clonal evolution. This makes IST a valuable option for managing SAA in absence of bone marrow transplantation. In this retrospective study, all patients who were treated with ATG and CSA from January 2011 to December 2012 were included and followed up for at least 1 year at Gujarat Cancer and Research Institute, Ahmedabad with permission of Institutional Review Board. The disease was considered severe AA (SAA) if hypocellular marrow was associated with at least two of the following: a neutrophil count of <0.5 × 10 9 /L, a platelet count of <20 × 10 9 /L, and a reticulocyte count of <1%. AA was considered very SAA (VSAA) if the criteria for severe disease were fulfilled and the neutrophil count was below 0.2 × 10 9 L. Chromosomal fragility test was not available. However, patients were screened for any phenotypic manifestation of Fanconi's and all had no family history of intrinsic BM failure syndrome or of consanguinity. Only 4 patients were screened for paroxysmal nocturnal hemoglobinuria by immunophenotyping and the rest had a negative sucrose lysis test. Viral markers HIV, HBsAg, HCV were negative in all patients and history of chemical and radiation exposure was ruled out. No specific cause was found all patients. All patients were treated with horse ATG at a dose of 40 mg/kg for 8 days or 80 mg/kg for 4 days through a central line over 4-6 h infusion. A test dose of ATG (0.1 ml in 10 ml on forearm) was given before first course of ATG. Premedication with hydrocortisone and pheniramine maleate was given before daily dose of ATG. For the prevention of serum sickness, intravenous methylprednisolone was given at 2 mg/kg divided into 0.5 mg/kg 6 hourly doses over 8 days followed by tapering protocol of 1.5 mg/kg divided into two equal doses on day 9, 10 then 1.0 mg/kg divided on day 11, 12; 0.5 mg/kg on day 13, 14, and 0.25 mg/kg given on 15 th day. CSA was started at 10 mg/kg orally on day 1 and continued for responding patients until they become transfusion independent and for at least 1 year with monitoring of CSA level every week for the first 2 weeks and then once every 2 weeks for the remainder of the treatment or as necessary to maintain a whole-blood CSA level between 200 and 500 ng/ml. Those who failed to respond discontinued treatment after 6 months of treatment. There were 18 patients. Of which, 7 were pediatric (4 male: 3 female) and 11 were adult patients (8 male: 3 female), who were treated for aplastic anemia with ATG and CSA between January 2011 and December 2012. Median age of pediatric patients was 9 years and of adult patients was 35 years. Pretreatment characteristics of study population are shown in [Table 1]. The median follow-up time was 20 months (13-35). One pediatric patient died within 1 month due to intracranial hemorrhage and one adult patient was lost to follow-up (LFU) within 1 month after taking ATG, so 2 patients were excluded from analysis. Finally, 10 adults (9 AA: 1 VSAA) and 6 pediatrics (5 AA: 1 VSAA) were analyzed for response [Table 2]. 6 months after treatment, 6 out of 10 (60%) adult patients had remission (1 had CR and 5 had PR) and in pediatric subset, only 1 patient out of 6 (16.7%) had PR. At the end of 1 year, 5 out of 10 (50%) adult patients had remission - 3 CR and 2 PR (2 PR converted in CR and 1 patient had relapse on 200 days and in pediatric subset 2 out of 6 (33%) had remission - 1 had CR and 1 had PR. One child had delayed response achieving CR at 430 days. So finally, 50% response rate in pediatric patients (2 CR: 1 PR). Both patient with VSAA responded, 1 had PR and 1 had CR. [Table 3] shows overall response rate according to time. Four out of seven (2 adults and 2 children), non responders are alive and on supportive care at present. 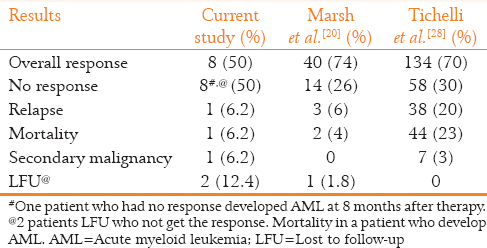 Of remaining three, one adult patient later on develops acute myeloid leukemia (AML) and died, and remaining two were LFU. Patients who did not respond were supported by regular blood transfusion to maintain Hb >7 g/dl. Platelet transfusions were given for clinically evident bleeding and in the asymptomatic patient if platelets <10,000. Episodes of febrile neutropenia were managed with broad spectrum antibiotics. Blood counts of all 8 (5 adult: 3 children) patients, who responded showed an improvement in at least one cell line within 3 months. 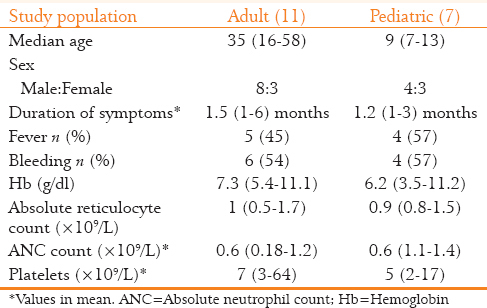 Median time of recovery of Hb was 153 (60-320) days, absolute neutrophil count (ANC) >500 was in 64 (30-150) days, ANC >1000 was in 110 (50-260) days and platelets recovered in 96 (50-160) days as shown in [Table 3]. One patient who had achieved PR at 150 days relapsed on the 200 th day. Due to the financial constraints, the patient was put on supportive treatment at present and he is still alive and transfusion-dependent. No patient developed serum sickness. Gum hypertrophy developed in 14 out of 16 (87%) patients. Hypertension was experienced by 5 out of 16 (31%) patients, requiring short-term antihypertensives. Laboratory evidence of renal dysfunction was recognized in 2 (12%) patients, which normalized after discontinuation of CSA. Febrile neutropenia was present in 11 (68%) patients, in which 2 patients developed lobar pneumonia. One adult patient who never achieved transfusion independence developed AML after 8 months of treatment. Side effects profile is described in [Table 4]. The present study cohort included consecutive patients from a single center. All patients had SAA or VSAA. Patients with mild or moderate AA were excluded. Although the present study may be criticized for the small number of patients treated with ATG-CSA, heterogeneity of immunosuppressants used and of being from a single center, yet it illustrates clearly the real life challenges of many hematology-oncology centers in the developing world. Only 18 patients out of 102 diagnosed as AA in 2 years could receive IST, largely due to costs restraints. This also may be compounded by challenges in delivering such an important treatment at the optimal time. Late presentations and referrals, difficulties in making ATG/CSA optimally available, associated comorbidities and complications, constraints in supportive care like antifungal, antibacterials, and isolation may all contribute to the relatively unsatisfactory results. It is also important to realize that non-SAA is the major group of patients who do extremely well with ATG therapy. Once this group is excluded, there is marked variation in the results for the treatment of SAA with ATG at different centers. , It has been seen that patient with mild/moderate AA respond to immunosuppression much better than those with SAA or VSAA. Stanazol has been shown to be effective only in 38% of non-SAA in Indian patients with no responses in SAA and VSAA. The available Indian data on the use of ATG in adults according to Agarwal et al. showed 40% response rates to ATG in SAA and no response in VSAA compared to which our study demonstrated response rates 50% in adults with SAA and 100% those with VSAA (but only 1 patient had VSAA). According to pediatric data of Chandra et al. response to ATG was 50%, which is similar to our study. We compared our study with different international studies as shown in [Table 5]. The 6.2% mortality (1/16) in the study cohort is similar to patients using androgens and lower than stanazol (22% mortality) within 2 months of starting therapy. Another Indian series reported 100% mortality in nonresponders to ATG. Unhygienic living conditions led to increased morbidity in Indian patients. Because of improved supportive care, better control of infections and the use of leukocyte-depleted blood products, patients can be kept alive during prolonged periods of pancytopenia before and after treatment with IST. , This also allows for the delayed recovery of BM function and salvage treatment with thesecond course of IST. Initial mortality can be reduced with early diagnosis, early referral, and better care. Patients being LFU is also a major issue, as in our study, 1 patient (5.5%) was LFU after getting treatment and 2 (28.7%) were lost after not getting a response. This is because of poverty, lack of education, and logistics related to long distance. Relapses were seen in SAA patients after attaining PR. It was seen in 1 patient who relapsed after a first course. Over half of such patients may respond again. Unlike most of the published series, in our study, only 1 patient (6.2%) relapsed compared to Tichelli et al. where the relapse rate was 20%, possibly due to prolonged duration of CSA therapy and slow tapering. In a study from the European Group for BMT group, 10-year cumulative risk of secondary malignancy was 18.8% in AA patients treated with IST,  while another study reported an incidence of 25%. The risk was particularly high in patients treated with a repeat course of IST. , In our study, only 1 patient (6.2%) who did not respond to IST developed AML after 8 months, which is low compared to a study by Tichelli et al. (20%). Clinically, apparent adverse effects of CSA were mild, but the drug causes subclinical organ toxicity and is expensive. , We therefore, recommend tapering and finally discontinuing CSA in patients with stable remissions for 12 months so as to avoid early relapse. Favorable early results of the treatment with ATG, methylprednisolone, and CSA have been confirmed in several small series and large trials. ,,,,,,,,,,,,4[,1]5],,,,,,, ATG and combination of CSA are more effective than CSA alone. AA may be particularly sensitive to CSA in children. This report demonstrates that IST is of therapeutic benefit to half of the adult and pediatric aplastic anemia patients. Although CR was seen in 30% in adults and 33% in pediatric cases, but overall 50% cases were able to enjoy transfusion-independent life, requiring no further treatment and no treatment associated adverse effects. SAA is very difficult to manage without the availability of BMT and in the presence of limited resources. ATG is a hope with reasonable response ATG rates in view of the fact that BMT is not available for every patient. Frickhofen N, Kaltwasser JP, Schrezenmeier H, Raghavachar A, Vogt HG, Herrmann F, et al.Treatment of aplastic anemia with antilymphocyte globulin and methylprednisolone with or without cyclosporine. The German aplastic anemia study group. N Engl J Med 1991;324:1297-304. Rosenfeld SJ, Kimball J, Vining D, Young NS. Intensive immunosuppression with antithymocyte globulin and cyclosporine as treatment for severe acquired aplastic anemia. Blood 1995;85:3058-65. Champlin R, Ho W, Bayever E, Winston DJ, Lenarsky C, Feig SA, et al. Treatment of aplastic anemia: results with bone marrow transplantation, antithymocyte globulin, and a monoclonal anti-T cell antibody. Prog Clin Biol Res 1984;148:227-38. Camitta B, O′Reilly RJ, Sensenbrenner L, Rappeport J, Champlin R, Doney K, et al. Antithoracic duct lymphocyte globulin therapy of severe aplastic anemia. Blood 1983;62:883-8. Bacigalupo A, Brand R, Oneto R, Bruno B, Socié G, Passweg J, et al. Treatment of acquired severe aplastic anemia: Bone marrow transplantation compared with immunosuppressive therapy - The European Group for Blood and Marrow Transplantation experience. Semin Hematol 2000;37:69-80. Frickhofen N, Kaltwasser JP, Schrezenmeier H, Raghavachar A, Vogt HG, Herrmann F, et al. Treatment of aplastic anemia with antilymphocyte globulin and methylprednisolone with or without cyclosporine. The German Aplastic Anemia Study Group. N Engl J Med 1991;324:1297-304. Camitta BM, Thomas ED, Nathan DG, Santos G, Gordon-Smith EC, Gale RP, et al. Severe aplastic anemia: a prospective study of the effect of early marrow transplantation on acute mortality. Blood 1976;48:63-70. Frickhofen N, Heimpel H, Kaltwasser JP, Schrezenmeier H, German Aplastic Anemia Study Group. Antithymocyte globulin with or without cyclosporin A: 11-year follow-up of a randomized trial comparing treatments of aplastic anemia. Blood 2003;101:1236-42. Miller AB, Hoogstraten B, Staquet M, Winkler A. Reporting results of cancer treatment. Cancer 1981;47:207-14. Naithani R, Chandra J, Sharma S. Acute myeloid leukemia after intensive immunosuppressive therapy in aplastic anemia. Indian Pediatr 2005;42:939-42. Agarwal MB, Agarwal UM, Bhave AB, Vishwanathan C. Anti-lymphocyte globulin therapy in acquired aplastic anaemia. J Assoc Physicians India 1993;41:371-3. Bacigalupo A, Hows J, Gluckman E, Nissen C, Marsh J, Van Lint MT, et al. Bone marrow transplantation (BMT) versus immunosuppression for the treatment of severe aplastic anaemia (SAA): a report of the EBMT SAA working party. Br J Haematol 1988;70:177-82. Marwaha RK, Bansal D, Trehan A, Varma N. Androgens in childhood acquired aplastic anaemia in Chandigarh, India. Trop Doct 2004;34:149-52. Chandra J, Naithani R, Ravi R, Singh V, Narayan S, Sharma S, et al. Antithymocyte globulin and cyclosporin in children with acquired aplastic anemia. Indian J Pediatr 2008;75:229-33. Saracco P, Quarello P, Iori AP, Zecca M, Longoni D, Svahn J, et al. Cyclosporin A response and dependence in children with acquired aplastic anaemia: a multicentre retrospective study with long-term observation follow-up. Br J Haematol 2008;140:197-205. Schrezenmeier H. Treatment of Aplasticanemia with Immunosuppressin and Hematopoient Growth Factors: 25 th Annual EBMT Meeting Eductional Book. Hamburg, Germany; 1998. p. 123-31. Tichelli A. Immunosuppressive therapy in aplasticanemia. Blood 2011;117:4433. Bacigalupo A, Bruno B, Saracco P, Di Bona E, Locasciulli A, Locatelli F, et al. Antilymphocyte globulin, cyclosporine, prednisolone, and granulocyte colony-stimulating factor for severe aplastic anemia: An update of the GITMO/EBMT study on 100 patients. European Group for Blood and Marrow Transplantation (EBMT) Working Party on Severe Aplastic Anemia and the Gruppo Italiano Trapianti di Midolio Osseo (GITMO). Blood 2000;95:1931-4. Gluckman E, Esperou-Bourdeau H, Baruchel A, Boogaerts M, Briere J, Donadio D, et al. Multicenter randomized study comparing cyclosporine-A alone and antithymocyte globulin with prednisone for treatment of severe aplastic anemia. Blood 1992;79:2540-6. Gupta V, Gordon-Smith EC, Cook G, Parker A, Duguid JK, Wilson KM, et al. A third course of anti-thymocyte globulin in aplastic anaemia is only beneficial in previous responders. Br J Haematol 2005;129:110-7. Tichelli A, Passweg J, Nissen C, Bargetzi M, Hoffmann T, Wodnar-Filipowicz A, et al. Repeated treatment with horse antilymphocyte globulin for severe aplastic anaemia. Br J Haematol 1998;100:393-400. Di Bona E, Rodeghiero F, Bruno B, Gabbas A, Foa P, Locasciulli A, et al. Rabbit antithymocyte globulin (r-ATG) plus cyclosporine and granulocyte colony stimulating factor is an effective treatment for aplastic anaemia patients unresponsive to a first course of intensive immunosuppressive therapy. Gruppo Italiano Trapianto di Midollo Osseo (GITMO) Br J Haematol 1999;107:330-4. Schrezenmeier H, Hinterberger W, Hows J, Ljungman P, Locasciulli A, Marin P, et al. For the EBMT SAAWorking party second immunosuppressive treatment of patients with aplastic anemia not responding to the first course of immunosuppression: A report from the working party on severe aplastic anemia of the EBMT. Bone Marrow Transplantation 1995;15 Suppl. 1: S10. Socié G, Henry-Amar M, Bacigalupo A, Hows J, Tichelli A, Ljungman P, et al. Malignant tumors occurring after treatment of aplastic anemia. European Bone Marrow Transplantation-Severe Aplastic Anaemia Working Party. N Engl J Med 1993;329:1152-7. Marsh J, Schrezenmeier H, Marin P, Ilhan O, Ljungman P, McCann S, et al. Prospective randomized multicenter study comparing cyclosporin alone versus the combination of antithymocyte globulin and cyclosporin for treatment of patients with nonsevere aplastic anemia: a report from the European Blood and Marrow Transplant (EBMT) Severe Aplastic Anaemia Working Party. Blood 1999;93:2191-5. Reghavachar A, Kolbe K, Hoffken K. Standard immunosuppression is superior to cyclosporine/filgrastim in severe aplasticanemia: the German Multicemter Study [abstract]. Bone Marrow Transplant 1999;23 Suppl 1:S31. Kojima S, Hibi S, Kosaka Y, Yamamoto M, Tsuchida M, Mugishima H, et al. Immunosuppressive therapy using antithymocyte globulin, cyclosporine, and danazol with or without human granulocyte colony-stimulating factor in children with acquired aplastic anemia. Blood 2000;96:2049-54. Fogarty PF, Yamaguchi H, Wiestner A, Baerlocher GM, Sloand E, Zeng WS, et al. Late presentation of dyskeratosis congenita as apparently acquired aplastic anaemia due to mutations in telomerase RNA. Lancet 2003;362:1628-30.